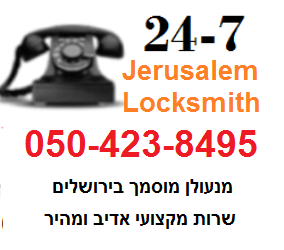 Welcome to Jerusalem Locksmith Company . we provide locksmith service to costumers at home, business ,car . We’re not just a locksmith company; we are your partner in security, and it’s our mission to make sure you have the right keys to open the right doors in your life. A partnership is based on trust, and we consider this to be our best quality. A good practice when moving into a new home is having your locks changed. We give you peace of mind by completing a home security audit and making sure you and your family are safe. A new home deserves proper home security locks. This includes security locks, secure window locks, and garage door locks. We provide complete property security from all angles of your home and business. We offer excellent solutions using the latest gadgets, equipment and locksmith procedures. as a result Our team is committed to providing robust solutions so that you can feel confident about the safety of your valuable possessions. We guarantee for the unfailing and high performance of security locks that we install.